lying like dogs curled up in the open. because I spoke evil in the gods' assembly. and declare a war to destroy my people? It is I who give birth, these people are mine! And now, like fish, they fill the ocean!" The Epic of Gilgamesh is an epic poem from Babylonia and is among the earliest known literary works. 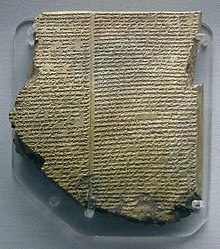 A series of Sumerian legends and poems about the mythological hero-king Gilgamesh, thought to be a ruler of the 3rd millennium BC, were gathered into a longer Akkadian poem long afterward, with the most complete version extant today preserved on twelve clay tablets in the library collection of the 7th century BC Assyrian king Assurbanipal. He came a far road, was weary, found peace. the travails of Gilgamesh, all that he went through! Who is there, my friend, can climb to the sky? Only the gods dwell forever in sunlight. let your heart have no fear, keep your eyes on me!" O Mighty King, remember now that only gods stay in eternal watch. For you to enjoy short pleasures for your short days. there was no place to land, so back it came to me. finding food, bowing and bobbing, it did not come back to me. incense I placed on the peak of the mountain. A thief has taken hold of my flesh! and wherever I turn, there too will be Death. A story of learning to face reality, a story of "growing up." A document of ancient humanism. Acceptance of human limitations, insistance on human values—this is the teaching of the life of Gilgamesh. ...this discovery is evidently destined to excite a lively controversy. For the present the orthodox people are in great delight, and are very much prepossessed by the corroboration which it affords to Biblical history. It is possible, however, as has been pointed out, that the Chaldean inscription, if genuine, may be regarded as a confirmation of the statement that there are various traditions of the deluge apart from the Biblical one, which is perhaps legendary like the rest. This page was last edited on 16 March 2019, at 21:49.